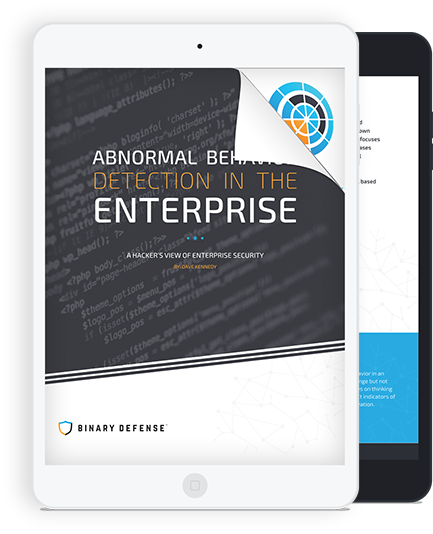 What’s In ‘Abnormal Behavior Detection In The Enterprise‘? Attackers are continuously changing their tactics when it comes to the methods they use to disguise their techniques. It’s becoming increasingly harder to find these attacks, and the standard detection on signatures and large copious amounts of data is no longer adequate for prevention and detection. Abnormal patterns are based on techniques that attackers use in order to compromise an organization and perform post exploitation scenarios. This paper covers a different way of thinking about defense, and baselining your organization from a known-good strategy. As the perimeter continues to shrink, cloud infrastructure, and the mobile workforce of today – it’s never been more important to identify abnormal patterns within multiple layers. Founder and Chief Technology Officer of Binary Defense, Dave Kennedy, created Binary Defense to transform the security industry for the better. Dave co-founded the Penetration Testing Execution Standard (PTES) and has integrated this methodical approach into Binary Defense’s technology. Simply put: Dave is one of the world’s leading security experts. With Dave at the helm and top-notch, well-seasoned security hunters filling out our ranks, it’s no wonder you’ll gain a wealth of institutional knowledge and a true ally.